Those look great! Were you able to find Teese locally? Or did you have to special order it? I have wanted to try it for forever! My husband found the Teese at our local food coop, but we only live a few hours from Chicago. It's from Vegan Dad and we really love it. I just used eggplant to make ratatouille and think your recipe would have been a good choice too. Willy. But, taste aside (and the taste in this case is significant) the nutritional profile is a little strange. Per serving there are 9 grams of fat (okay, I can live with that) and 0 grams of protein. Other than 150 mg of salt, all the other values (calcium, vitamin A, iron, etc.) are also 0. This may be a product you use as a flavor enhancer rather than as a grilled cheese sandwich. I feel like a traitor even saying this. Tell me I'm wrong. I am in MN, but I have yet to see Teese...I hope it arrives here soon! What a great idea! I always feel like quesadillas could use a bit of, I don't know, lightening up I guess. 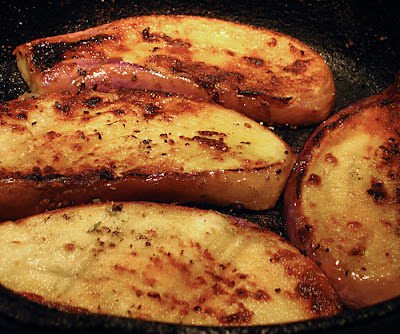 Eggplant sounds perfect texturally and yet would cut the richness. Hi, I found you via Ricki's blog. I'm in the Wellsphere vegan community so maybe I'll *see* you over there sometime. I'm happy to find another vegan cooking site. This post was so cute. I live in Texas where we eat Mexican food 2 or 3 times a week. 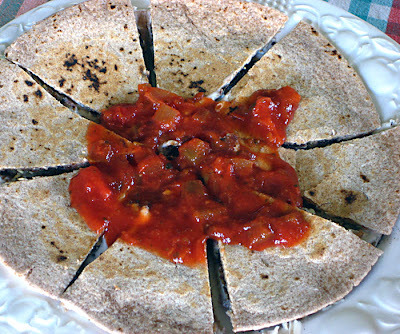 I've never tried to make vegan quesadillas though, because it's really the cheese that holds them together. It might be pretty easy in a sandwich maker though. Thanks for stopping by. I went to your blog and it looks great - can't wait to spend more time there. About the quesadilla—I did use vegan cheese to hold it together. I used Teese. I also sometimes use Vegan Gourmet, or make something from Uncheese Cookbook when I need cheese in a recipe.